Bohol Republic: Heneral Luna: Adelante! Their loss. 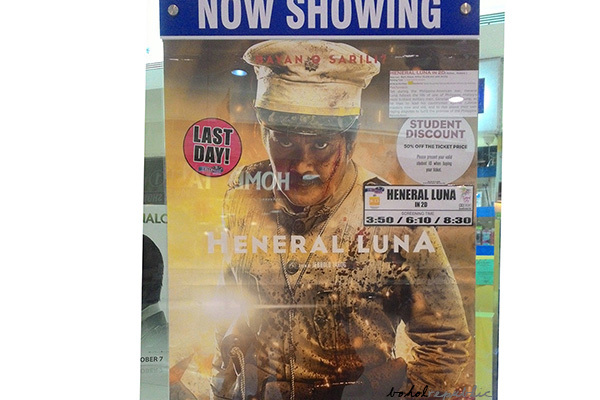 Heneral Luna is epic. It has flaws worthy of a movie sins episode but is overall a gripping cinematic fare worthy of a pert Heneral Luna salute. Adelante! But even so, I am itching to discuss some of its hits and more so its misses. HIT. John Arcilla, no doubt, gave justice to the Tarog’s Luna, the lunatic only slight charismatic but well-respected leader of the post-Bonifacio revolutionary army. MISS. Way older Luna. General Antonio Luna was 32 when he was assassinated (June 5, 1899), and has been involved in the reform movement for perhaps roughly 10 years. (This is the same old guy for a young role formula, which to me was especially off-putting in El Presidente with ER Ejercito – Aguinaldo was younger than Antonio Luna by 3 years, Ejercito is older than Arcilla by 2-3 years.) The problem is, I’m not sure if there are actually age-appropriate Filipino actors today fit for this role. (Or perhaps, there are in the stage scene.) I might just let this slide, though a younger actor could have pulled the younger audiences in, and (the actual youthful character imagery) could also perhaps reinforce the role of youth in social change. HIT. Cinematography, production design and the creative scenes were on point: whip-wielding Luna, the Spoliarium, and the burning flag. Luna, the General. It’s a story that started in media res with creative flashbacks. However, I think Luna’s character beyond his absurdities was not well developed, I didn’t feel that I’d want to root for him. The military tactics he pioneered, the Luna sharpshooters, the guerilla unit Black Guard, the Luna defense line, etc. were tackled but not enough. The Luna defense line was perhaps the most discussed (with the scale model thingie and the 3-day recruitment and all), but its cleverness was not really highlighted. He could summon thousands, impressive, but it was dampened down by the fact that he supposedly threatened to kill them all if they didn’t follow him. Who would care for such a protagonist? And that scene of whipping out the civilians from the “military” train? Precious. And obviously recalls Jesus’ driving out heathens from the temple. The scene with his mother and the surrealistic flashback during their days in Spain was kinda confusing because another actor was used to depict a younger Antonio Luna. In my mind, I was like, just go along with it, go along with it. The “apostasy” and the brutality of the Americans. Provided that a whole other film could and should be made on how the Americans hijacked our independence from Spain, but I think every film set during this period, should tell the story of the American atrocities in the Philippine-American War where about 250,000 to a million Filipino civilians died. There was a montage of village raids and killings of civilians but not impactful enough. Provided, the film is really about the assassination of General Luna by his own President, no less, highlighting the puerile silliness of the Philippine revolutionary government and the people running it. Plagued by infighting, regionalism/ clanism, elitism, chuvanism – it is good to know that we are still at it. Punyeta! Philippine Government of Elitism, Regionalism and Absurdism since 1896.